Want to run your fastest 10K? Well, this plan is for you. I set a goal to run my fastest 10K when I was at a low point... my weight was more than 30 pounds over goal, and my pace was more than 3 minutes (per mile!) slower than I needed it to be to run my personal best. I wrote this plan based on what I did to run the best 10K of my life. I set a goal, and I actually completed it! (Here is the race report). My intention with this plan was for a goal of running a 10K under 60 minutes, which is a popular time goal; but I’ve included other goal times and paces as well, because this plan will work for people with just about any goal from 45:00 to 1:30:00. This plan is designed with an 80/20 ratio of easy running (80% or more of the TIME spent running) to moderate or hard running (20% or less) per WEEK. This is the ideal ratio for reaching your maximum potential as a runner. Katie, I have been doing this plan of yours since mid July. I love it! I have done two 10Ks before but not really in a goal-oriented way. It has been fun to try to set an actual goal and train towards it. You have definitely helped me fully identify myself as a RUNNER, despite being overweight and slower than others. I have a question: how do I run the final race? Haha, okay, so I know I need to move my feet and run but would you recommend trying to run my "race pace" the whole time? Right from the get go and up and until the finish line? Right now I am unsure I'd be able to do that... I did 4 miles at RP today and although I still have three more weeks of training I'm unsure I'd be able to do 6 mi consecutively at that pace now. How do you run your races? All my friends who run are like... skinny girl runners who have always been skinny and athletic so I just don't always like asking them questions like this. I appreciate you! Well, when I have done my races (while aiming for a particular goal), I have tried to run race pace for each mile split--so yes, running that pace right from the beginning. However, don't get discouraged! If you run the plan as specified, and do the key workouts in the plan, then I am confident you can run your goal time! When I was doing my goal 10K, several of my splits at the beginning were 8:00+ (I was aiming for 7:55). But somehow, in the last mile or two, I managed to make up for it. So, just do your best, and aim for your goal pace. You may surprise yourself! :) Let me know how it goes! Katie, I did it! I ran the 10K 1:04, 6 minutes faster than the 1:10 goal I had set and almost 9 minutes faster than the pace I ran for the same race in 2017 and 2016. Thank you soooooo much for your plan! I loved it! 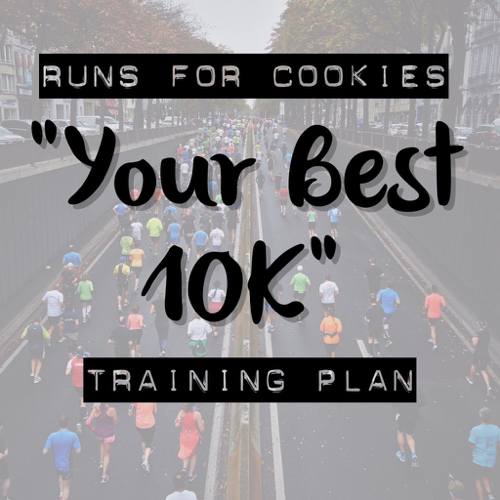 I'm going to keep using a modified version of your Best 10K plan while I continue to train for another 10K in November, and then I'm psyched to use your 5K plan for a Virtual in February and one of your Half plans for my first Half in May. Is there someway I can financially contribute to you? I really, really appreciate these free plans and would love to contribute something if possible. Thank you again!